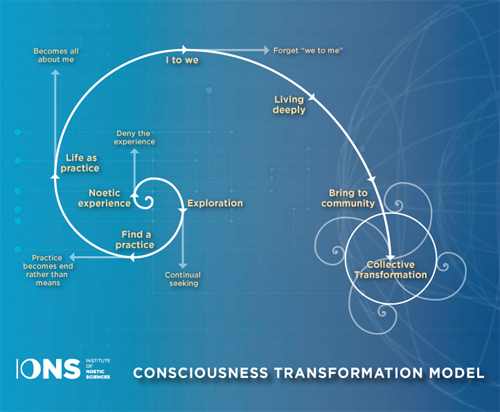 Last week I wrote about Professor Dean Radin and the team at IONS (the Institute of Noetic Sciences), who are conducting experiments at Burning Man as part of their research into consciousness. Some scientists debate whether consciousness exists at all, since there is no mathematical formula, chemical compound, or law of physics to explain it. They don’t “think” it is there – the ultimate irony. The word “scientist” has only been with us since 1837, but the idea of magic has been with all cultures for all time. It seems that these days, the world of science is taking a turn for the better. The sort of things that were formerly dismissed as impossible, or viewed by the more primitively inclined as magic, are being recognized as true phenomena. We should study the things we don’t understand, learn from them. Maybe one day we’ll figure them out and then they can become “science” too. Supposedly, we had no idea about gravity before an apple fell on Isaac Newton’s head. No matter that the Chinese and Greeks had already built flying machines, thousands of years earlier…but I digress. There’s a lot of stuff that happens at Burning Man that science can’t completely explain. The wicker effigy we burn has no consciousness of its own, yet there is a measurable rift in the space-time continuum formed by it. There’s also a lot of expansion of consciousness going on – the transcendental theme of the hippie Sixties. Many Burners like to accessorize this process with some sort of psychotropic substance. In fact, the father of drugs, Dr Alexander “Sasha” Shulgin, who synthesized 217 different psychoactive compounds, still lives today in the East Bay and is a repeat Burner. 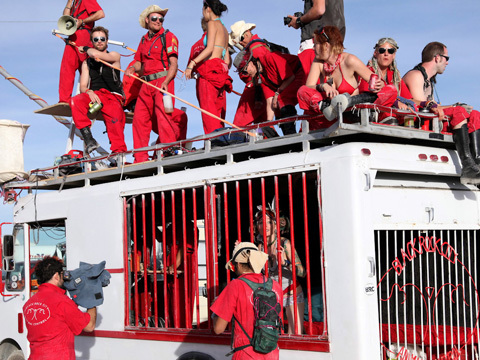 Are there animals at Burning Man? I’ve seen ’em! Would it surprise you to learn that animals seem to get off on that stuff too? It’s part of Nature, right. “All in the game!” Apparently hallucinogen-injecting scientists have been doing consciousness experiments on animals, just like government agencies here did to unsuspecting humans in the hijinks and capers of “Operation Midnight Climax – How the CIA Dosed S.F. Citizens with LSD”. One scientist who loved him some acid was Dr Francis Crick. He discovered DNA while on an acid trip – not a bad contribution to humanity, right? At Dr Crick’s Memorial Conference at his old college, Cambridge University in England, some of the world’s leading scientists gathered together to acknowledge that animals have consciousness, too. Elephants cooperate to solve problems. Chimpanzees teach youngsters to make tools. Even octopusesseem to be able to plan. So should we humans really be surprised that “consciousness” probably does not only exist in us? This privileged state of subjective awareness in fact goes well beyondHomo sapiens, according to the new Cambridge Declaration on Consciousness (pdf), which was signed last month by a group of cognitive neuroscientists, computational neuroscientists, neuroanatomists, neuropharmacologists, neurophysiologists who attended the Francis Crick Memorial Conference on Consciousness in Human and non-Human Animals at Cambridge University in the U.K. Birds appear to offer, in their behavior, neurophysiology, and neuroanatomy a striking case of parallel evolution of consciousness. …Magpies in articular have been shown to exhibit striking similarities to humans, great apes, dolphins, and elephants in studies of mirror self-recognition. Wait a minute...”non-human animals”…that seems to imply that there must be such a thing as “human animals”. Are all these scientists really signing a statement that says “humans are animals”? What does that then make Transhumanists and cyborgs? Google is a hotbed of glasshole Burners, from the very top down to the bus stop brigade. 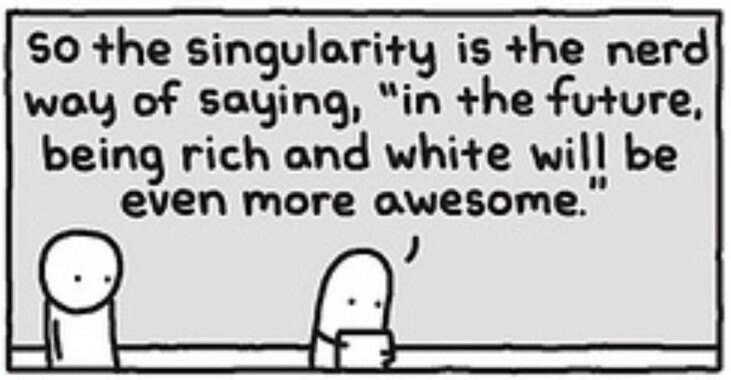 It also has more than its fair share of transhumanists. Their Director of Engineering Ray Kurzweil, who hopes to be immortal, thinks we should all merge with machines and extend our lifespans through a combination of genetic engineering, nanobots, and “reducing the biological component” that’s attached to our Android device. As they say in poker, “if you’ve been in the game 30 minutes and you don’t know who the patsy is, you’re the patsy”. Are corporations people? Are corporations animals? What about a massive Artificial Intelligences like Google’s that know everything we watch, read, speak, write, spend, do…is that an animal? Does it have a consciousness? What about Apple’s one, called SIRI? Hundreds of millions of people have interactive conversations with it every day. It is constantly answering questions from all over the world, and learning as it goes. Does that have consciousness? Does it have rights? The experiments going on around you at Burning Man, as we worship The Man and then immolate him on a pyre in an ancient Druidic tradition, are helping to answer these questions, some of the 21st Century’s most significant.